Hi there, if you’ve reached this page by searching on Google for “How to make an effective PowerPoint presentation” you’ll also be interested in my Guide How to make an Effective PowerPoint Presentation. I asked a number of experts for their tips on how to make an effective PowerPoint presentation. Follow these tips and you’ll be able to create simple and clear PowerPoint slides. Ellen Finkelstein: Many people start the process of creating a presentation in PowerPoint, by entering text on the slides. Bad idea. The content should drive the design. Bert Decker: The end result is totally PowerPoint driven, and we have information without influence and data without emotion. Joey Asher: Here’s what I’d like to see going forward. Let’s start creating presentations by taking out a blank sheet of paper and writing down what we want to accomplish and what our audience cares about. Geetesh Bajaj: Always start your presentation on paper — draw your ideas, link relationships between concepts, and create a storyboard. George Torok: The first thing that presenters need to do is to ask these important questions before creating their presentation. What’s the purpose of your presentation? What do you want you audience to do because of your presentation? What message do you want to deliver that will help you achieve that purpose? M J Plebon: Let the majority of people start creating with a clean white canvas. Jeromy Timmer: All of the standard Microsoft PowerPoint templates stink. Horribly. The ones that aren’t completely awful are so overused that they’ve become a cliche. Don’t use any of them. Christophe Harrer: When it comes to slide design, you shouldn’t think of decoration, but of communication. Everything you add to your slides should have a positive impact on the message you are communicating. This is why I always use a very simple design theme for my slides. There is no direct research on the use of templates in PowerPoint. However, there is research that shows that any material (pictures, sounds or information ) which is not conceptually relevant to the topic harms learning. Cliff Atkinson: The fundamental research results remain as true in 2009 as in 2008 – removing extraneous information from a screen actually increases learning. Just about every organisation has a template that you’re supposed to use when you create a PowerPoint presentation. The idea behind this is well-intentioned. Artistically-challenged staff can get into a horrible design mess with no guidance. But corporate templates tend to include a lot of distracting extraneous detail. 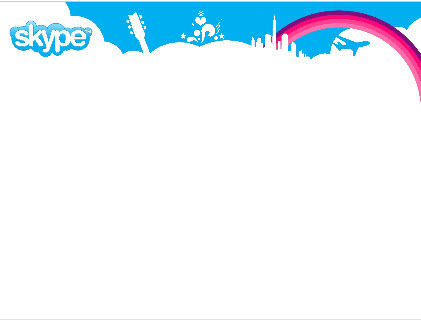 Check out this example from Skype (thanks to Jan Schultink for highlighting this one). You can still incorporate your brand into your presentation material. Create a color palette based on your logo or on a photo representative of your industry. My favorite tool for this is Kuler. 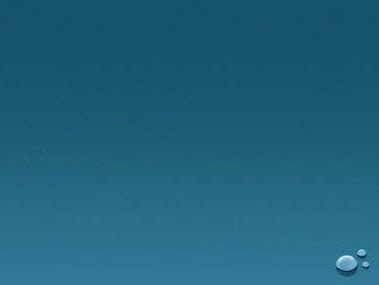 You can allow yourself a small understated logo in a corner – such as in this background from Duarte. Presenters can completely transform their presentations from boring bullets to high-impact visuals by putting one point on a slide. Presenters must assure that slides follow good cognitive design principles. Something as simple as having only one main idea per slide makes a huge difference. Alley (et. al.) found that students were better able to recall the main assertion of slides when presented with a full-sentence headline written as an assertion compared to a word or phrase headline. Alley, M., Schreiber, M., Ramsdell, K., & Muffo, J. (2006). How the Design of Headlines in Presentation Slides Affects Audience Retention. Technical Communication, 53, 225-234. Fewer words on each slide (ideally one sentence headline, no more than two lines, that states the assertion of the slide). Instead of bullets, support your points with graphic evidence. This can include photos, images, charts and diagrams. Christophe Harrer: Say the words and put the visuals on your slides. Lisa Braithwaite: Support your points with creative and relevant images. Michael Alley: Use graphics rather than bullet lists to support the headline. 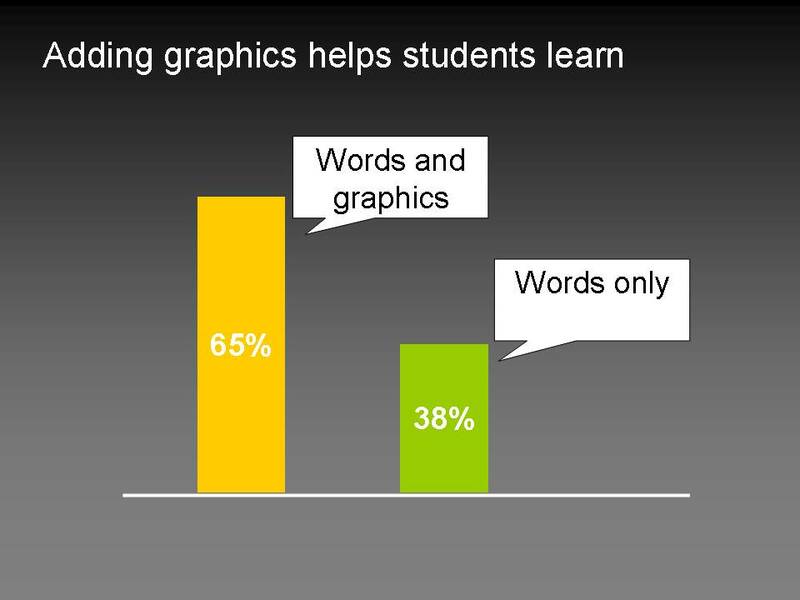 In all ten comparisons, students who received a multimedia lesson consisting of words and pictures performed better on a subsequent transfer test than students who received the same information only in words. For the past 20 years, my colleagues and I at the University of California, Santa Barbara have been conducting scientifically rigorous experiments aimed at determining what works with multimedia presentations. My hope for the future is that the results of this research can be used to improve the effectiveness of PowerPoint messages. Andrew Lightheart: You only need a visual aid in a presentation if you would need one in conversation. Michael Alley: Slides should be projected only when they serve the presentation. What do you do when you’re not showing a slide? You insert a plain black slide into your slideshow. Bert Decker: This is a simple concept, and yet it is profound when you use it all the time. It’s a game changer! Or maybe, PowerPoint is not the most appropriate tool at that time in your presentation. Lisa Braithwaite: Just like no one person can meet all of your relationship needs, no one tool can meet all of your presentation needs. I like to use flip charts with or without PowerPoint; flip charts used to sketch out an idea, get input from the audience or provide a group activity keep a presentation lively. There’s movement, there’s interaction, there’s problem solving, and the activity is spontaneous, created on the spot. Mike Pulsifer: Well-designed slides are terrible handouts since they lack the on-slide text necessary to form an informative narrative. [Create] handouts that are distributed after the presentation. Cliff Atkinson: Your handouts [are] the repository for detailed information. Simon Raybould: [Have] well-written hand-outs to leave behind after the presentation for those who want to know the whys and where-fores. These will have to be different from the slides of course! I’m not aware of any research specifically on this point. But given that research indicates taking detailed text off the slides, creating handouts for detailed information makes sense. A list of all the blogposts with a one or two sentence summary of each post. A list of all the blogposts with quotes from each post. The e-mail contributions that I received quoted in full. These are from Cliff Atkinson, Guy Kawasaki, Julie Terberg, Michael Alley, Nancy Duarte, Richard Mayer and Seth Godin. PowerPoint Slide Design: Does Design Matter? Simplicity versus detail in powerpoint slide design. The most promising slide technology for 2009. Thanks olivia for adding my thought in your post, and I really enjoy this project. Corporate templates for PowerPoint never cease to astonish. Some are definitely art forms. And some are simply product packaging. But most just get in the way of good communication. It’s interesting to see that learners, both young and old, have the same tendencies when creating PowerPoint projects. I like to have the students create “rough drafts” on paper before they begin to actually use PowerPoint. Young students tend to focus more on the “fun stuff” rather than focus on the subject matter. It is also important that the students create projects that have an audience in mind. Students need to keep things simple at a younger age. Great tips, great supporting evidence. Every tip is easy to understand, and easy to implement. Every time I teach a course and require a presentation, I have to explain what a good (and bad) presentation looks like. I will definitely incorporate some of these ideas into my lecture. Thanks. Whether academics or business, the more professional your presentation is, the more competitive you will appear. Taking the help of professional templates often help me present more confidently and I am sure your tips are going the help me a lot further. Thanks a lot for sharing! A perfect slide isn’t one that has everything. A perfect slide is one that has nothing it doesn’t need. Great way of putting it Kevin. This article is great and tips are very professional. My boss wanted me to create a ppt presentation to market one of our COTS products. Before, I was thinking of putting sentences and explanations to the slides bec the product needed to be introduced to a target customer. But with this, I am now relieved by the thought that I need not to make the slides look stressful with words. Thanks for this! I really feel more confidant after reading your article. My prsentation will be next week, so I am worried somehow of being lost while I present the subject. I thought that colours are very important to distingush the presentation, but really colourless slides are more effective, they are coloured with the ideas presented. Wow! so informative and inspiring. Thanks very much for this tips. I will be presenting a scientific presentation in October 3 & 4 @ Sheraton hotel Dammam Saudi Arabia and i’m struggling a lot because this will be my first presentation to a big crowd. I hope everything will be alright after reading your article on how to be an effective presenter. it is very professional and effective tips. i hope it will be very useful in presentation. Fantastic concept Rashmi. One can eialsy make up for all those lost conferences and presentations. The current solution of exporting on complete HTML pages is plain bad. Neither downloading the entire slideshow and seeing it in the fullscreen added any worth to the presentation. The compact size, no-nonsense and intutive interface adds to the overall value. I loved the concept and I am sure it will be a very useful app. Corporate/branded slide templates don’t have to be boring. Having a Powerpoint slide design that matches the mood of the company is important. Several websites feature a long list of categories from which anyone can choose attractive slides for presentations. There are way too many places to find captivating slides for business presentations to be bland. can any one help me in making project on powerpoint presentation on (slide & setup) in powerpoint. Many thanks for the valuable information! On bullet #2, unecessary should be unnecessary. In my experience, trainers and presenters have demanded bullet points for convenience. Many trainers and presenters I’ve worked with do not want to memorize text or content or read from printed notes; they want to be able to “read: the slides. What’s a designer to do? Powerpoint is really wonderful, but when it comes to web designing, am simply not that working hard towards it. But right now, am good in designing and will continue till i get to the top 1 position of best designers.